Robert Uttal Robert Uttal spent over 45 years in the heavy transportation industry creating massive enterprises in big trucks and helicopters. He is Snow & Associates’ Director of Helicopter Flight Operations – Rosie O’Grady’s Flying Circus. Based in Orlando, Robert operates the number one sightseeing helicopter service in Florida and Georgia with custom aerial safaris for one to five hundred people. His company, Bulldog Airlines, is probably best known for its providing helicopters as camera ships and on-screen aircraft for the movie industry, local and national TV network affiliates, and as promotional and advertising aircraft. The movie projects his aircraft have appeared in or have supported include: - Apollo 13 - Just Cause - Dumbo Drop - SeaQuest - Fire Down Below - Inheritance - Contact - Striptease - Birds of a Feather - Thunder in Paradise - Body Snatchers ‘95 - Congo - James Bond - Golden Eye - The Pelican Brief - Lightning Force - True Lies Other commercial enterprises Robert has supported include: Mark Kohl Pictures, Chuck Tamburro Enterprises, Mike Fuller Marine Photography, NBC Sports (NBA finals), Toyota (commercial), Bahamas Islands (commercial), and many more. Other notable achievements: - Was Chief International Judge of World Helicopter Championships held in 1996 in USA and 1999 in Germany governing 300 participants from 17 countries. Reelected again for 2002 & 2005. 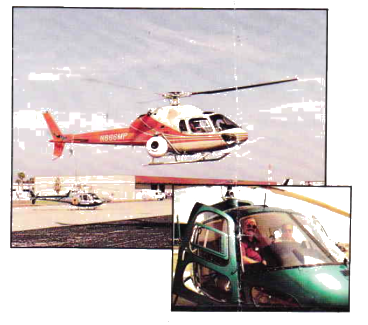 Represents America as Helicopter Chief International Judge through National Aeronautic Association. - Former National Board Director & International Officer for the 6,000 member US chapter of the Paris based "Chaine des Rotisseurs", developing & directing as its US National Officer and division Chairman of the 3000 Food & Wine Professionals.